It was lovely to return again to this gorgeous Guildford venue, with the stunning flowers for this beautiful wedding at Loseley. We have arranged several other weddings at Loseley over the years but I think this is my favourite so far. 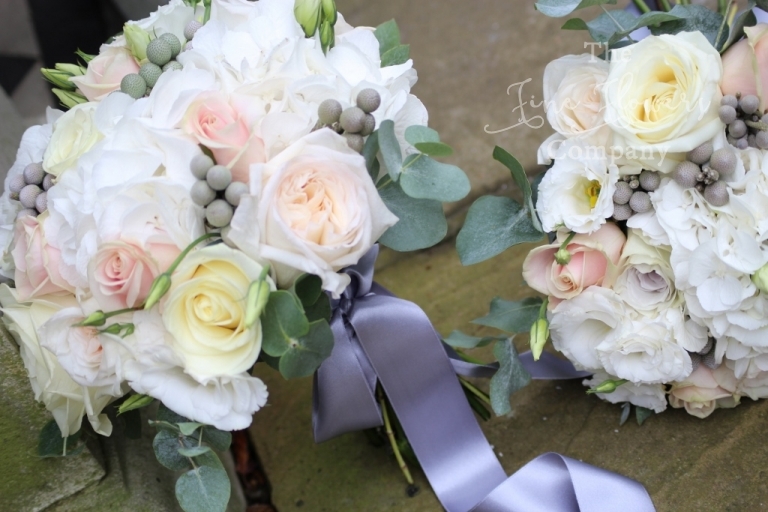 The soft light at this time of year and the beautiful wedding colour scheme, really suit the venue. And all the vintage style white, silver and gunmetal accessories which Louise and Nick had so carefully selected really made a difference, and were perfectly complemented by our new and very elegant tall silver fluted vases. 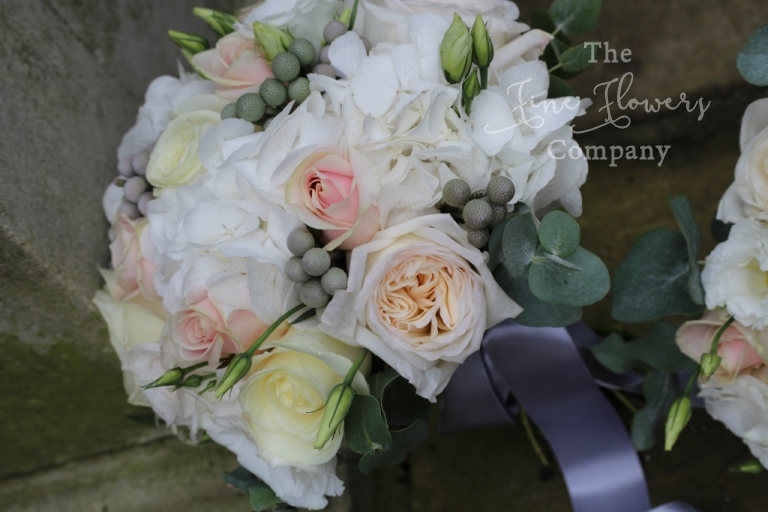 For this classic wedding at Loseley, Louise opted for textural bouquets of ivory Avalanche roses, gorgeously layered O’Hara tea roses, and pale pink Sweet Avalanche roses, with pretty hydrangea and lisianthus. 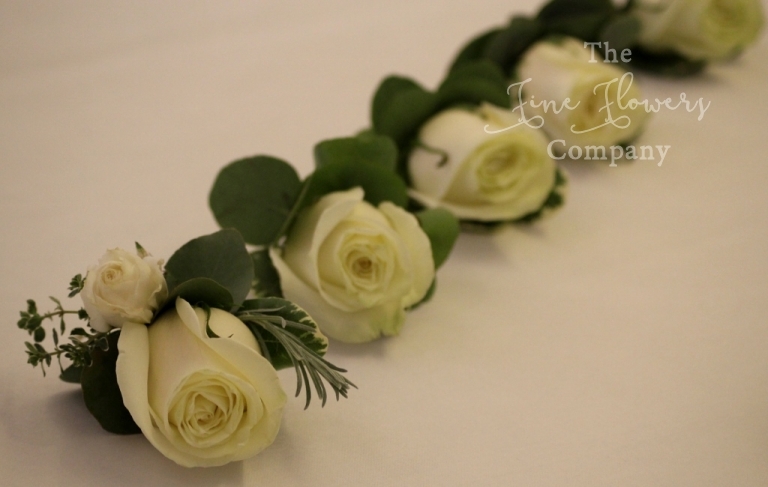 The bridesmaids bouquets were finished with silver ribbons to match their dresses. The men wore buttonholes of ivory Avalanche roses framed by silvery eucalyptus. The ceremony room, already very grand and stately, didn’t need a a lot of help to make it ready for a wedding – we simply reused some of the guest table centrepieces – low ones on the registrars tables and tall ones on ivory plinth stands to rise up above the eyeline of the guests when seated for the ceremony. The tithe barn wedding tables were dressed with elegant silver vases with pretty romantic displays of ivory flowers – roses, dahlias, hydrangeas, lisianthus and lacey gypsophillia, all offset just by silvery eucalyptus foliage to echo Louise’s table accessories colours. 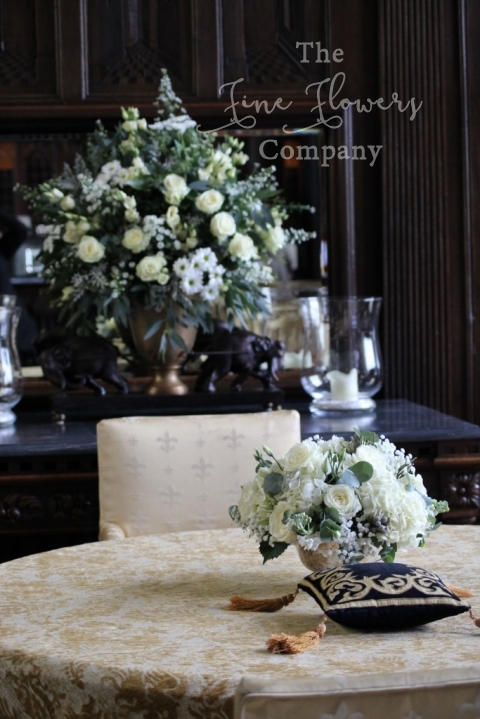 To make it more interesting and give guests more details to discover as they enter the room, we mixed tall silver fluted vase centrepieces, which add drama to the room from a distance, with cosier low silver revere bowl centrepieces. Above the cake stand, we hung a beautifully opulent flower wedding wreath from the beam, and wrapped the beam with foliage and fairy lights garlands.